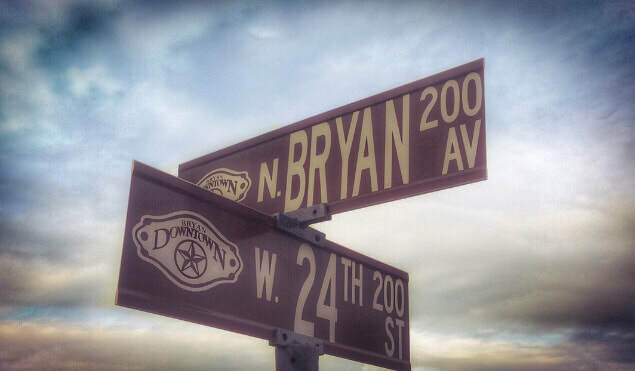 The sign at the corner of our new home of 218 North Bryan Avenue. Many of you have asked what we need and/or how much it will cost to move into our new space. We finally have answers for you. Below is a list of the most important things priced out. There is more, but this will get us where we need to go for now. Building storage shelving and rods for props, costumes - ?? More comfortable chairs - We were donated 30 chairs by Michelle Wagley, and to purchase more chairs of the same type it will cost $80 each. Our audience capacity is 70, so we will need 40 more chairs, for a total of $3200. If you would like to help us out with specific items, please contact us when you make your donation to let us know which direction you want us to point it. You can make donations on our website or by mail, or at any performance. Murals are bringing character to the outside walls downtown and, now that we are going to be the sole residents in a corner location, we thought we'd add just a little more character...literally. We have commissioned Lucas Dickson to paint a faux stage - with curtains and all - on the side of our building, where people will be able to pose in their favorite roles in front of it.. Lucas is a very talented local artist whose work you may have seen on the stage of The Theatre Company. But, as is always the case with theatre, his work goes away when the next production comes in. We think he's amazing and we are excited to get him for a more permanent project! ©2018 StageCenter Theatre. All rights reserved.